The Philippines is made of more than 7,000 islands is indeed a remarkable country. It is indeed a beautiful country to explore as it is dotted with many natural wonders. With several active volcanoes and typhoon prone areas, one can certainly look forward to some unique experiences in the Philippines. Summer is coming and that means you have to start planning trips with your friends and make the most the sun has to offer. Thanks to places like Tablas Island resort it is so much easier to find accommodation in different beaches. 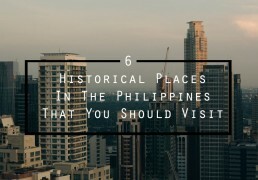 To represent the Philippines’ triumph against the colonizers, here are some of the historical places you should visit.